Now, in 2018 a very different picture has become evident in terms of how we purchase, listen to and find out about the acts that we love. The record industry is becoming more and more unstable, with the rise of online portals such as Apple Music, Spotify, Amazon etc and the big record companies simply don’t wield as much power anymore. Music choices are diversifying as people can find and listen to whatever they want, whenever they want, and pretty much wherever they want. This has had an impact on live music too, with the number of festivals increasing significantly year on year. It is also now common to see major acts from the past reform to take advantage of the new interest in live music. So, the question now is how do artists both new and established make their money, given they cannot rely on single and album sales alone? The answer is live gigging. In fact, according to report by Mintel, since 2008 musicians now make more money from live performances than from record sales. Another reason to rely on live gigging is the change in technology and the explosion of the online world. It’s easier than ever to ‘steal’ music from various sites and listen to your songs via other methods without paying a penny to the artist. Live shows cannot be stolen! And although it’s a long road perhaps to get your music heard, each festival or show that you perform at, you are showcasing to more and more people. Word of mouth and personal recommendations cannot be underestimated, especially with the rise of social media and its live functionalities, gigging means that it’s not just the people at the festival that may be hearing the show. The media, and the internet, have also helped to make live music events seem unmissable. Appearances at these festivals and shows can help musicians to gain international and even global recognition. In the UK, the broadcast of such events is now and established feature of summer television, where, with use of the red button you can flick between stages and performances with ease, right from your sofa. For the vast majority of artists, playing live is as natural as a chef being asked to prepare food. It’s why they became an artist in the first place; a chance to get immediate feedback from their fans about their music and grow a following. But, perhaps surprisingly for other artists, those that are a bit more ‘manufactured’, it’s actually often not automatically assumed to be part of their job. There is no such thing as an overnight success like there perhaps was back in the late 20th Century. Playing your music to new and established audiences is the route now that a lot of musicians must take. For new artists and those looking to get signed to any kind of record deal, playing at live shows is essential. 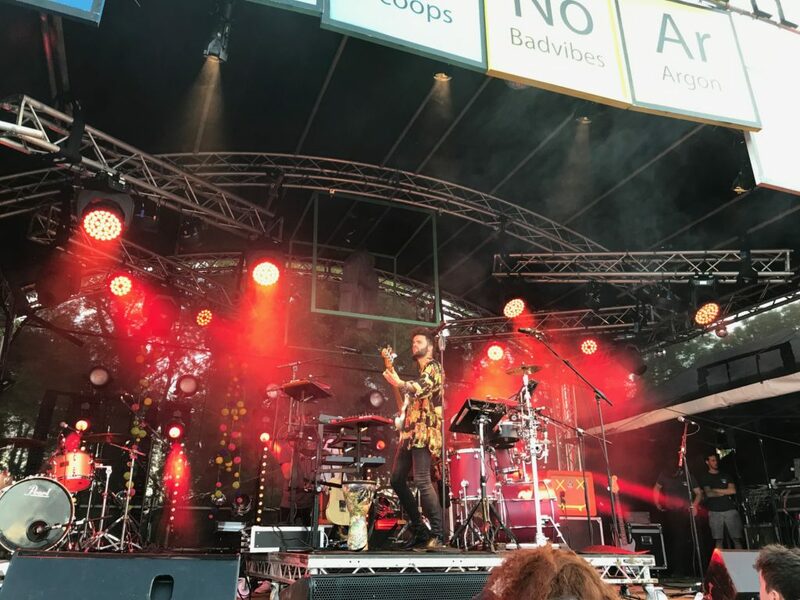 Many festivals have a new acts section or stage which is a great way of getting yourself out there, learning what works, which songs people respond to and how it all operates. There are a huge number of scouts that spend their days visiting festivals and shows to source new artists. And you never know what can happen from just one gig, it only takes one person to like you and put their faith in you. 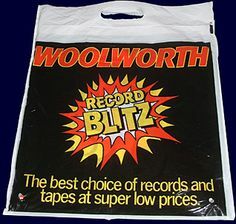 Also changed are the days when you’d have to post your demo tapes to every radio station in the land. The rise and success of entities like BBC Introducing mean it’s much easier to get your work in front of the right ears. The Great British Festival Season is underway and we are now very busy at GBG HQ having been out on the road to various events already this year. Amongst the busy-ness and organised chaos of loading, building, hosting, packing-down and loading again we thought it would be good to take you back to basics a little bit and look at the essence of what we do. 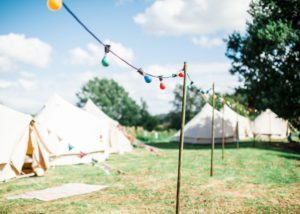 In this instalment of our blog we look at what Glamping actually is, how popular it has become and we also tell you a few of the many ways you can Sleep Under 5 Stars with us; be it at one of the festivals we are involved with, a beautiful Festival Wedding or just a good old party! Above is the ‘official’ definition of Glamping. We would go one step further than the above: Glamping with us does not just mean facilities more luxurious than traditional camping, we would like to think that it is about making your experience more exhilarating by eliminating the difficult and frustrating bits that camping brings, and raising the bar on your whole experience. Research from Google’s Digital Garage, a free online training service for businesses, shows a 118pc year-on-year rise in Google searches for glamping (May 2016). Paul Reed, general manager for the Association of Independent Festivals, said: “We have seen a significant rise in glamping and more family orientated events and this can be attributed to a change in demographics-many people who grew up attending festivals now have children but still want to go to events and not compromise on comfort. 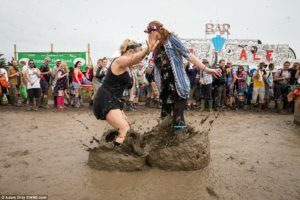 Matthew Bagwell, director at Naked Communications, a consumer experience consultancy, said: “A generation of festival goers have now grown up and they want to relive the festival experience – but in a more civilized way. Glamping is a halfway house between a festival atmosphere and having home comforts. When you go glamping with us at Great British Glamping, you are, as we like to say, sleeping under 5 stars. Your bell tents come equipped and furnished so your packing list is considerably less; which is incredibly handy, especially if you have children. We can provide onsite reception facilities, toilet hire, pamper tent service and lots of other additions, to make sure you are never without their creature comforts, be it at a festival, party, wedding or any other event. Interested? See below for what we offer and where and how you can get involved! Holding a festival-themed wedding can bring you so much more than a more traditional wedding. Festival weddings are vibrant, colourful, and often much more unique and memorable because you can effectively handpick every aspect of your event. 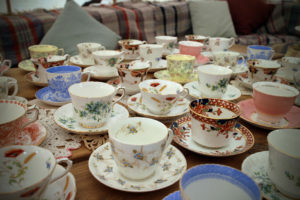 Glamping tents and marquees in a field are blank canvasses for you to choose your colours, themes, flowers and detail. You are not tied down to venue finishing hours or wine choices. You can choose when and where you hold it, what you dance to and what you eat. Your guests are offered flexible and fun canvas accommodation onsite and you can extend the party into the following day too, giving you precious time with those that may have travelled a distance to see you. Whether you choose a more formal more elegant affair for your outdoor wedding or select a more chilled casual festival vibe, we would love to help you plan and execute your perfect festival wedding and we are brimming with ideas and contacts for your vision to be brought to life. 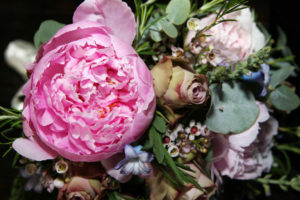 Please click here to read our blog on planning a festival themed wedding. 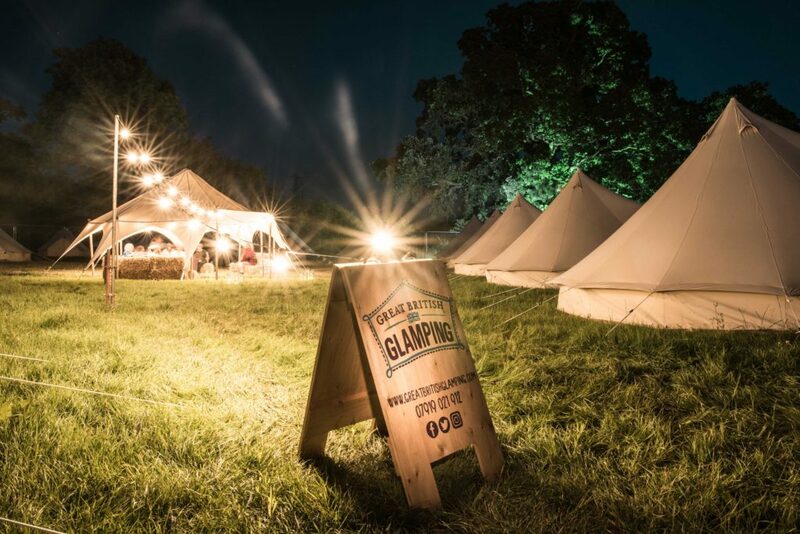 Great British Glamping is delighted to be involved with a number of festivals throughout the festival season and again at our festivals we provide the client with a level of luxury that a normal festival experience wouldn’t provide. Arrival at the festival and find your beautiful bell tents already fully equipped and furnished for you so you don’t need to lug a huge amount of stuff from home. 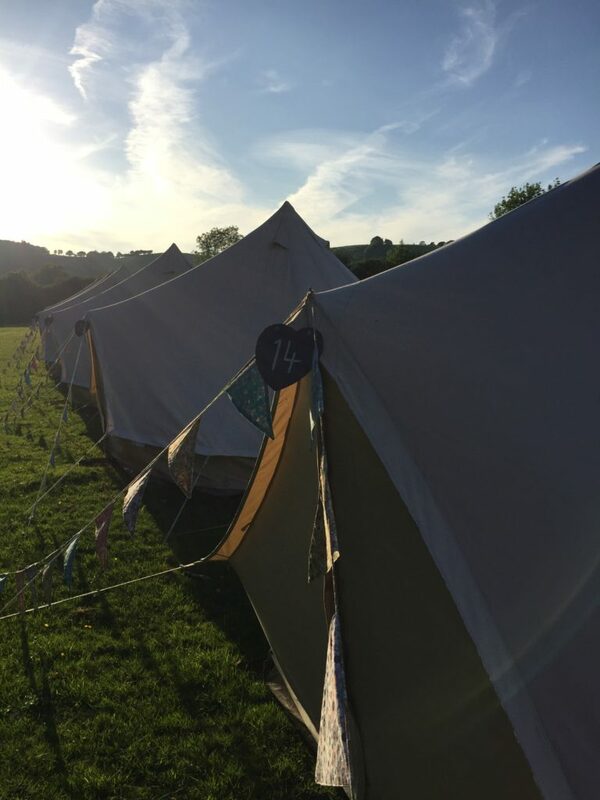 If you are going to experience the thrills and spills of everything that a festival brings you then it’s very reassuring, handy and adds a bit of luxury to have Great British Glamping on hand to make your experience just that little bit easier. It’s still perhaps not something that many people consider when they think about celebrating a big birthday or a special event, but providing glamping accommodation for your guests for a party or even going the whole hog and holding your very own mini festival is such a unique and memorable way to celebrate that is certainly a little more special than a hotel or local pub! 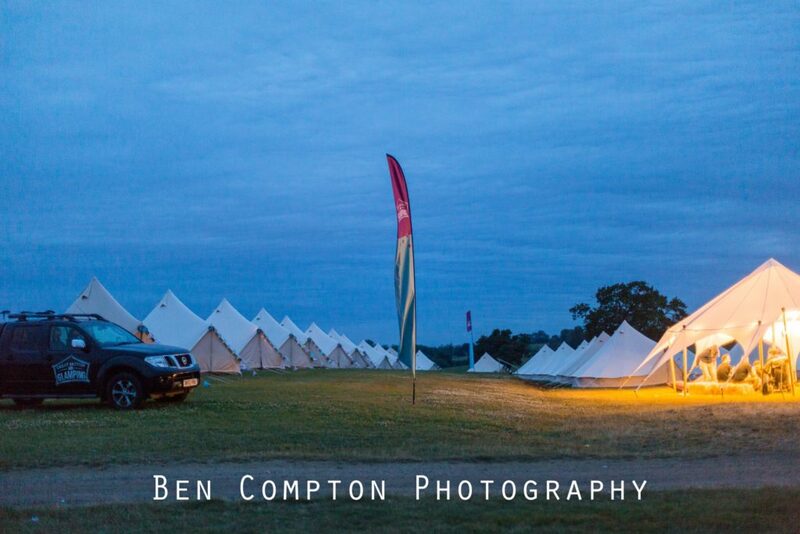 We can provide a fully bespoke, decorated and furnished village of tents to house your guests, reducing the need for late-night taxi runs and keeping the party going on into the night. In addition, many of our clients use our tents as a space to put tired children to bed, or as a chill-out option for those in need of some quiet-time. We can be as involved or hands-off as you like with the final set up and work on a completely bespoke basis so talk to us for more information on how to make your event unique and memorable. We hope that this blog has gone some way to explain a little bit more about Glamping in all its refined glory. As always, we are always delighted to talk through with you about any ideas or occasions you’d like to celebrate. We often have ideas and plans that you may not have thought of so why not get in touch? We can be contacted by email on hello(Replace this parenthesis with the @ sign)greatbritishglamping.com">hello(Replace this parenthesis with the @ sign)greatbritishglamping.com or directly by telephone on 07919 021 912. Don’t forget to follow us on Facebook, Instagram or Twitter to stay in touch with all the festivals and exciting plans we are working on this year; don’t be shy! Although many people would gasp in horror at the idea of taking your children along with you to a festival, there is definitely a shift in the industry toward more family-friendly festivals. An ever-increasing number of events are actively embracing the family-festival vibe and it’s now more common than ever to see family groups enjoying the live event scene. In fact, many families now use festivals as a great mini-break; the array of live music, acts, entertainers and workshops combined with fantastic atmosphere and a sense of outdoor adventure is a very popular choice. Roll-in a glamping accommodation option and it really couldn’t be easier to escape to a festival with the children in tow. 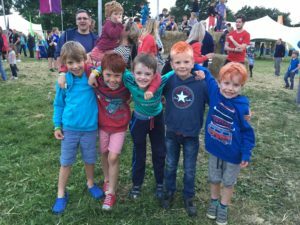 Great British Glamping is a family business, and with two young boys we appreciate many of the challenges that going to a festival may bring! 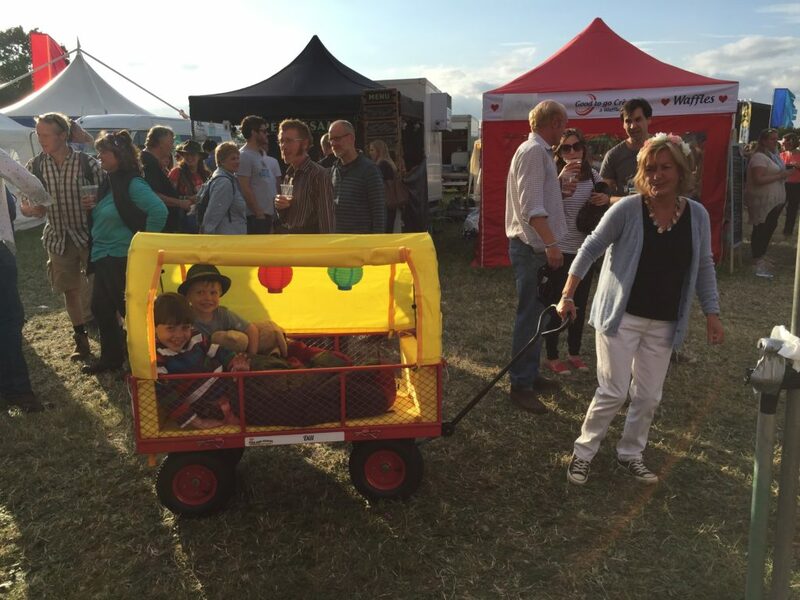 In the years that we’ve been working with different festivals, we have been so pleasantly surprised at just how well some of them cater for children and just how easy it can be to take them along with you for a truly great British weekend! The 3 Wishes Faery Fest in Mount Edgcumbe Country Park, Cornwall on 15th-19th June is the UK’s largest and most famous faery festival. It is brilliantly child friendly and under 7s get in free. They have lots of music acts to suit all ages and tastes together with a quieter camping area for those that have children or prefer a quieter night. Most people get completely into the spirit of the event by dressing up which would delight most children! The Staxtonbury Music Festival held on 7th-9th July in Staxton, near Scarborough, North Yorkshire makes no secret of the fact that family groups are their main priority. The entire site is enclosed and safe with designated family areas as well as a multitude of attractions the question will be what will the children do next rather than what will the children do! 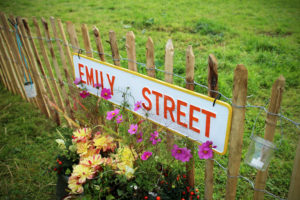 They go to town on children’s entertainment for all ages, from Magic Mike Shows, Punch & Judy Shows, Little Steff’s Musical Storytime, they also have free tennis, football and golf coaching and the most popular of all ‘Farmer Tom’s’ Haystack. There is an arts and crafts Marquee as well as children’s discos on the Friday and Saturday evenings. Not to mention bouncy castles, slides, bunjees, quad bikes, waterbalz, climbing walls, zorb footballs and the list goes on! 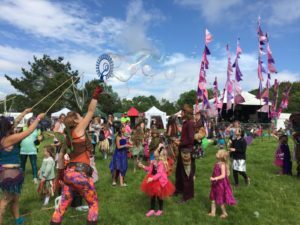 The Faerie Festival in East Sussex on 19th– 21st May is a small but beautifully formed festival that caters amazingly well for children. Under 5s are free and their children’s activities are also provided by a specialist entertainment company at no extra cost, providing a wide range of activities from dressing up, dancing, puppet singalong, toys, sandpits and lots and lots of bubbles! We know how much ‘stuff’ having children means you haveto bring with you when you leave your house. 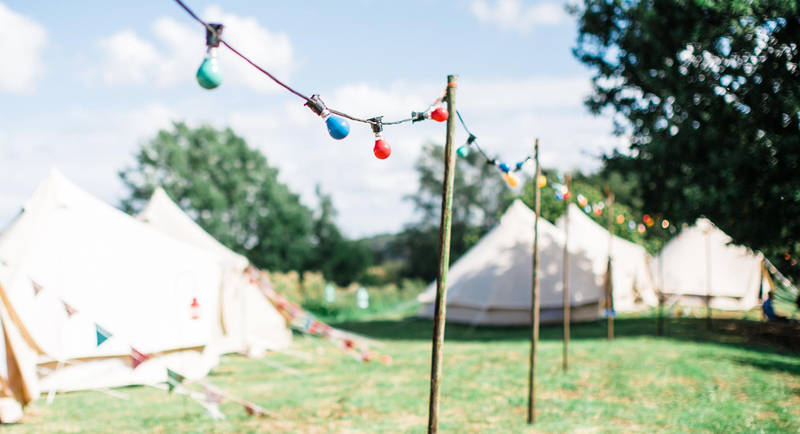 Our beautiful bell tents are at all three of the festivals above and come equipped and furnished allowing you relative luxury without having to pack everything you may need before leaving home. Most of all – have fun! If you’ve been to festivals pre-children, then your experience this time around will be just a little bit different. You will love seeing the excitement and joy on your children’s faces as they run around and discover new and crazy things. Don’t forget to enjoy yourself, break the rules a little bit and you’ll be surprised just how adaptable children can be! 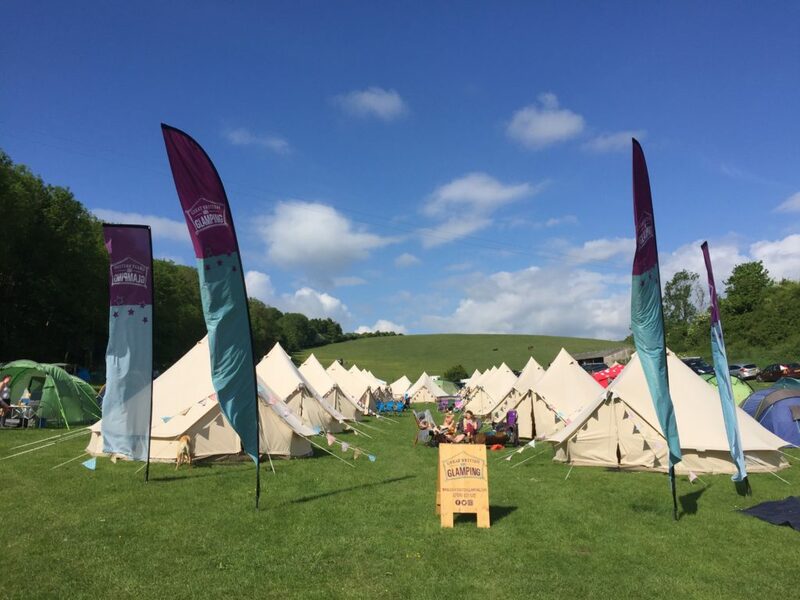 If you are attending any of the festivals that Great British Glamping is a part of then please do give us a call or send us a message to find out more about how we can help you make it that little bit easier, whether you have children or not, we’d be delighted to chat through some options with you. Picture the scene: As darkness falls on the most amazing wedding day, you look across at your new husband smiling back at you and you feel like the luckiest girl in the world. The children celebrating with you have been put to bed safely in their family tents and the fire pit has been lit for the evening. You pick up your glass of champagne and sit back, gazing up at the stars knowing that the day is simply perfect. 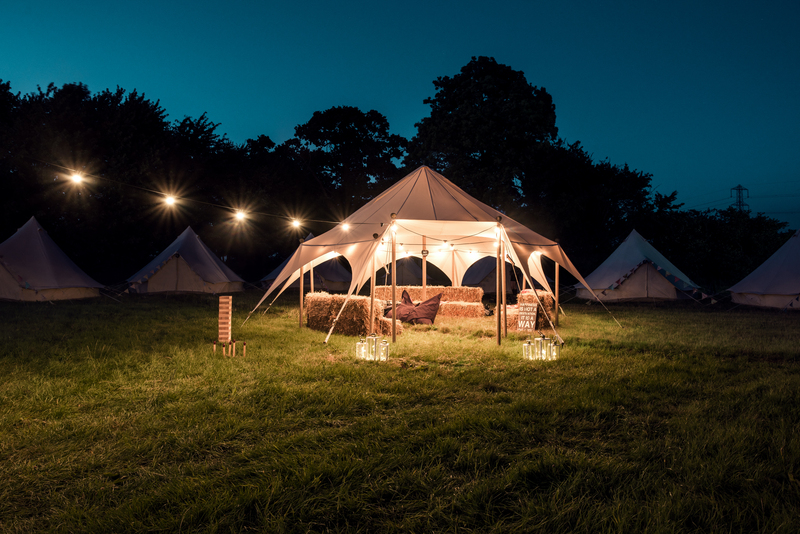 You never want it to end and the beauty of having a festival wedding is that is doesn’t have to… As all the guests are staying with you for the night in their luxury glamping tents, the party can continue long into the early hours and the following day. Choose invitations that match the look and feel of your big day – perhaps opt for ones that look like a festival ticket or a wrist band if you are really heading down the festival theme. Remind your guests in advance to dress for an outdoor venue and bring a selection of clothes for the evening and next day, perhaps flip flops and wellies! Other ideas that a festival wedding allows is a fancy-dress theme perhaps, asking people for their own music playlist suggestions, or even getting artistic friends to get involved with the flowers and decorations. Get your guests in the festival spirit by hiring circus performers, dancers and magicians to kick off the wedding. Choose a great band to get people onto the dance floor and consider having a photo booth in the grounds with fun props and costumes. Furniture made of hay bales such as giant sofas, tables and even bars can create memorable backdrops. Keep the fun going long into the evening, with everyone sat round a campfire, toasting marshmallows, blankets to keep warm and offer warm drinks such as hot chocolate and mulled cider, before the guests retire for the night in the cosy luxury of their glamping tents. Choose oversized pom-poms, helium balloons, ribbons or bunting to decorate the inside and outside your marquee. Light candles and use flowers to create walk ways to the various areas. Get creative when it comes to wedding favours with homemade sweets, chutneys or jams. Create handmade vintage-style signage to direct people to their seats and even to the wedding itself. Use Pinterest to build ideas and don’t be afraid to be bold – after all a wedding is worth putting the effort into! Many brides and grooms worry about their guests bringing children to their big day, how they’ll be entertained, and if mums and dads will be able to properly relax. Some small elements and clever thinking can help make the day enjoyable for all. Children’s entertainers can be a great addition to the wedding party and you may even want to set-up a specific area for children, with hay bales to climb on (and contain them!) and perhaps hire a babysitter or two to keep an eye on them once put to bed. rom wood fire pizzas in horsebox trailers to gourmet BBQs there are abundant options for your to select from. Mexican midnight munchies or even candy floss machines can all add some festival-inspired fun to your food options. It’s not something that you usually get an enormous choice with when wedding planning, so take advantage and do something different. 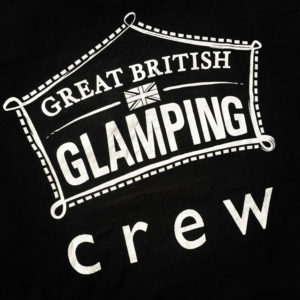 At Great British Glamping we can advise on luxury loo hire, mobile showers and portable power. Don’t forget lighting and do consider having marquee heating arranged to ensure a change in weather won’t dampen the part spirit. As the outdoor part of 2015 for Great British Glamping draws to a close and activities turn toward packing-down, cleaning and sorting kit before storing for the winter, we thought we’d take a look back at what was a fairly busy season. Aside from pre-season activities and meetings with clients and suppliers, attending trade shows, conferences and exhibitions, our first large event was back in May (only a few days after a major house move too, just to keep things interesting). We headed to the Welsh mountains to build our village in the beautiful scenery that’s home to Fire In The Mountain, a charming folk-inspired celebration that draws festival goers from across the UK and beyond. The initial fair weather soon turned typically ‘seasonal’ for Wales and we ended-up packing-down in some of the worst rain we’ve encountered. Thanks to a few days of fine sunshine once back at HQ – and some fantastic help from friends and family – we managed to get everything dried-out and packed ready for the next outing. The next festival took us to Cornwall – a GBG favourite – and we created a glamping village at 3 Wishes Faery Fest which afforded perhaps the best views our guests would enjoy all summer. The weather was on side this time and long sunny days ensured happy times at this great family festival. We then hit a busy period which meant lots of time out on sites and little time in between to re-charge and re-stock. A run of several festivals on the bounce saw us spread far and wide, with time in the Home Counties, North Yorkshire and the South West. We worked with some fabulous festivals, met some great people and gained a host of new friends. July rolled into August and we headed towards our final festival of the 2015 season, Fieldview Festival in Wiltshire. This year’s theme at Fieldview was certainly well planned; Club Tropicana vibes spread to the British weather and a mini-heatwave bathed the festival site in three days of glorious sunshine. A simply stunning new site and a great line-up rounded-off the festival season in style. 2015 was fun, busy and at times stressful and even a bit scary, but here at HQ we’re already well into planning for 2016. One consistency across this year that we are committed to carry forward into 2016 is the quality of service that we give to our clients and guests – this is something that we hold in very high regard and simply won’t compromise on. Thank you to anyone who’s been a client, guest, supporter, friend or general good sport in 2015 – we appreciate each and every one of you. Here’s to a great 2016 – we hope to see many more of you on the next stage of the journey. With the news this week that Snoop Dogg is to headline Mutiny this year, preceded by the announcement recently by Glastonbury Festivals that Kanye West will make his somewhat controversial debut there, do the headline acts on the bill actually matter that much to the majority of ticket holders? Well, research by the Association of Independent Festivals (AIF) has shown that festival goers value the ‘general atmosphere and overall vibe, character and quality’ of the event over headline acts. AIF launched a new initiative, ‘Festival Fever’, with the aim of highlighting the cultural and economic impact of independent festivals, with a focus on the broad experiential multi-arts offering of its member events. The organisation released figures showing that their member’s events have contributed an estimated £1bn to the UK economy over a four year period. Extensive audience research conducted by AIF has also revealed that over 635,000 music fans attended AIF member events in 2014, which ranged from 1,500 capacity Barn on the Farm to 75,000 capacity Isle of Wight Festival, and that last year £296m was generated by independent festival goers. From 2010-2014, over £80m of this came from audience spend along the supply chain including local businesses. In 2014, only 8.3% of respondents cited individual artists or headliners as the main reason they purchased a ticket for an independent festival, with 58% saying that the “general atmosphere and overall vibe, character and quality of the event” was the key reason for attending. Almost half of those interviewed (49%) said they chose attending an independent festival over taking a summer holiday last year. Also in 2014, 58.2% cite “general atmosphere, overall vibe and character of event” as the single most important factor in attending. 8.3% cite “headline acts” and 21.5% “the music generally”- illustrating the broad, multi-arts experiential offering of AIF member events. Paul Reed, general manager of AIF said: “Our extensive research clearly shows that the independent music festival sector is thriving and enjoying an extended period of fantastic growth. AIF members participating in ‘Festival Fever’ campaign will wear a digital badge across social media stating ‘Proudly independent,’ with another key component being the launch of ‘AIF TV’, a dedicated YouTube channel, which will host a competition for the best festival fan footage shot at an AIF member festival in 2014. The winner will receive an ‘Ultimate Festival Season Ticket’ giving them access to all 50 AIF member festival events throughout the year. 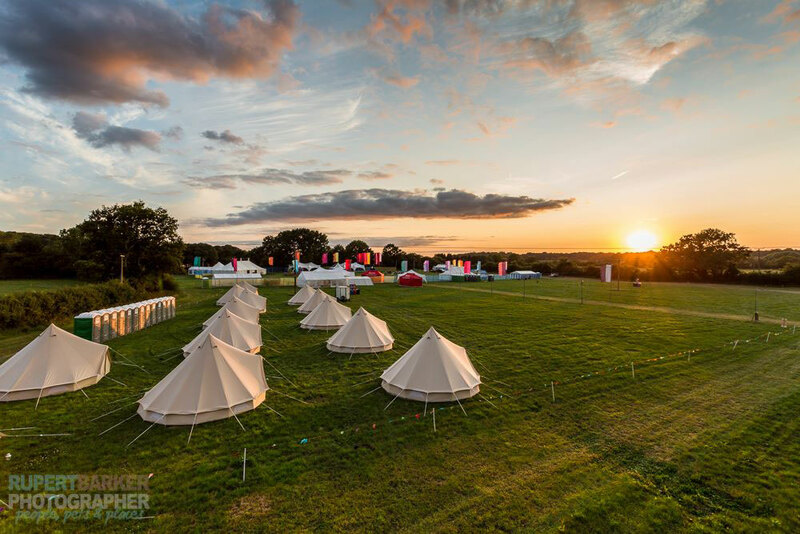 At Great British Glamping we’re proud to work with a range of small to medium-sized festivals providing beautiful pop-up glamping villages for festival goers, taking some of the hassle out of attending festivals and making the experience of guests more unique and memorable.